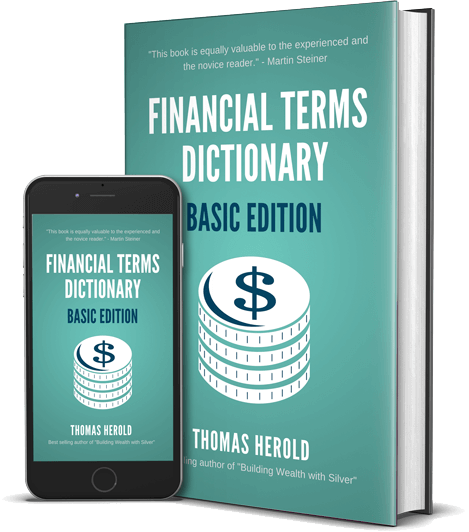 This practical financial dictionary for most popular terms helps you understand and comprehend most common financial lingo. It was written with an emphasis to quickly grasp the context without using jargon. Each of the financial terms is explained in detail (min. 600 words) and also gives practical examples. This book is useful if you are new to business and finance. It includes over 200 most frequently used financial terms for businesses, investors and entrepreneurs. It also covers the lingo that was introduced in the financial crisis of 2008 until 2017. With the alphabetical order it makes it quick and easy to find what you are looking for. Example Term: What is Debasing the Currency? Debasing the currency refers to the all too common historical process of lowering a currency’s actual value. In the past, this phrase commonly came to be associated with commodity money made principally from either silver or gold. Should the sum total of silver, gold, nickel, or copper be reduced, then the physical money is called debased. Even venerable institutions like the Roman Empire, with a thousand year history of growth and stability, have stooped to such debasing of the currency. Reasons that a government chooses to debase the currency in this way center around the financial benefits that the government is able to reap. These are done at the citizenry’s expense though. Governments that lowered the quantity of gold and silver in their coinage found that they could quietly mint more coins from a given fixed quantity of metal on hand. The downside to this for the general population centers on the inflation that this in turn causes. Such inflation is yet another benefit for the currency debasing government that then finds that it can pay off government debt or repudiate government bonds easier. The populace’s purchasing power is significantly reduced as a result of this, along with their then lowered standard of living. Debasing a currency lowers the value of the currency in question. Given enough time and abuse by the governing authorities, this debasing can even lead to a collapse in the existing currency that causes a newer currency or coinage to be created and launched for the nation or state. In present day times, debasing the currency is accomplished in more subtle means. Since currencies these days are made of only paper, involving no metal, debasing the currency simply involves printing additional paper dollars. With the advent of electronic banking, even this printing press operation is no longer required. The government simply creates money on a computer screen, literally conjuring it out of thin air. They are able to accomplish this in one of two ways. One way that they do this is via the Federal Reserve, which buys treasury securities by simply crediting the receivers’ bank accounts with electronically created money. The Federal Reserve then has tangible assets in Treasury bills that is it able to trade or sell when it wishes. Another way that this creation of money that debases the currency is able to be performed is through the Fractional Reserve Banking System. Since the Federal Reserve only requires banks to keep a ten percent reserve ratio of deposits on hand, these banks when they are credited funds from the Federal Reserve are able to loan this new money out in multiples that are equivalent to the leverage created by this ten percent only reserve ratio. In both of these ways, the Federal Reserve is able to create more money quietly and at will. This is how modern day debasing of the currency is effectively accomplished.